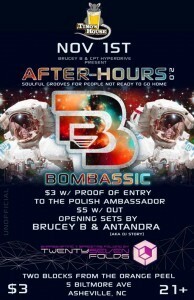 BomBassic (Asheville, NC) is the musical collaboration of Brucey B and Cpt. HyperDrive focused on creating sound full of emotion and energy. Raised on the raw sound of NY hip-hop, and groomed in Asheville’s eclectic electronic music scene, they exhibit a wide range of influences. From funk, classical, jazz to glitch-hop, house, and future bass, every resonating genre is explored. With Brucey B on the keys and HyperDrive controlling a custom DJ-FX rack, their high-energy live performance adds an incredibly soulful dimension to their sound. BomBassic’s music is always growing, in different directions, looking for new ways to connect with the listener. Originally from Long Island, New York, now based in Asheville, North Carolina, Cpt. HyperDrive and Brucey B met in high school and became friends on their shared love for hip hop and music in general. Brucey formed a local hip hop group, IRD, and a few years later HyperDrive asked to join. Welcomed into the group, Brucey B taught HyperDrive all of his production techniques and how to operate audio hardware. Their chemistry was evident and their skills kept progressing. In 2008, Brucey moved to Asheville, NC and began sending HyperDrive different types of electronic music. Both found a connection to the various genres of electronic music because of the arrangements, sounds, melodies and the overall composition. Passion for innovative music and introduction to new genres and artists inspired the two to form a new group. 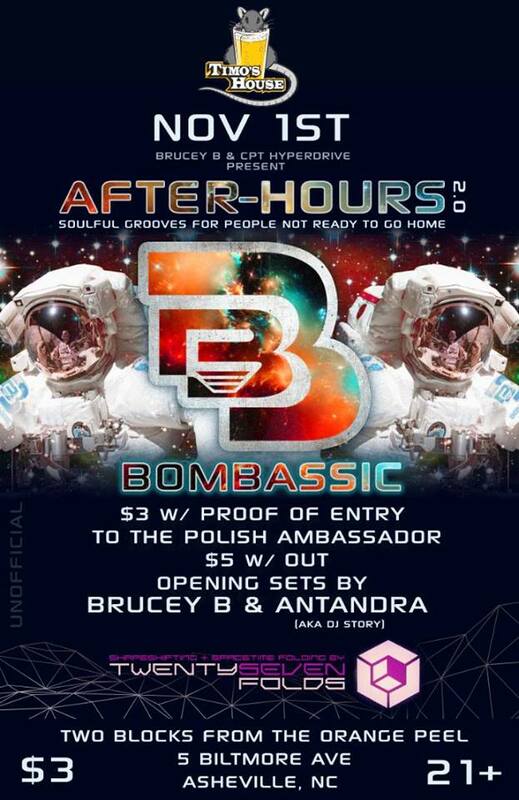 BomBassic was born in Spring 2011 in an effort to combine their experience of production along with the limitless boundaries of electronic music. Since then they have formed a deep catalog of soul moving material that continues to evolve in style and sound. Since early 2013, BomBassic’s live performances have featured nothing but original composed music with the added element of live keyboard performance and musicianship. They’ve been featured artists at Moogfest 2014, Kinnection Campout 2014, & Moog’s AHA AVL series while also sharing the stage with the likes of Eskmo, Michal Menert, Love & Light, Marley Carroll, Elaquent, Aligning Minds, Robot Koch, Pumpkin, Futexture, Push/Pull and more. Brucey B is the Asheville based electronic music producer and live performer most known for his work in the duo, BomBassic. An avid producer of hip-hop, and more recently known for his electronic influence, Brucey B has been evolving as an artist and musician since 2004. Years of classical piano study combined with a love for creativity and soul-filled music have propelled him to create a sound full of smooth laid-back beats and bass lines resulting in a contagious pleasure-filled aura.